Ensegway Madrid gives you the chance to visit our city in a different and funny way with this fantastic Premium Segway Tour of 2 hours. 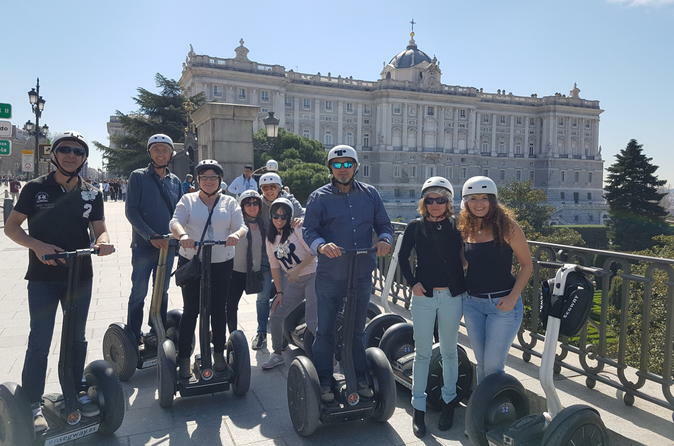 With the help of our guides enjoy a SEGWAY TOUR in the heart of the city and knowing neighborhoods as characteristic as the Barrio de las Letras, Madrid de los Austrias or La Latina and green areas such as Retiro or Debod park. With stops at the incredible monuments that we find on our way, we will enjoy the wonderful stories of Madrid and especially the main jewel of this city, the Royal Palace, the largest in Europe and the symbol of the Bourbon dynasty. During the routes, we also go through the most special corners that are usually left aside by most visitors. In short a very good way to discover the city, its history and heritage in a fun and adventouruse way. Our Premium segway tour of 2 hours departs from the Ensegway Madrid office at Street Union number 4, near the Opera Underground station, in the city center. To start the activity you will learn the safety rules and instructions to ride the segway and you will be provided with the safety equipment you will need (a helmet). After that you will have 5 to 10 minutes of training in our street, to easy learn how a segway works. All tours are tailor-made and can be customized with your guide before the departure, depending on your skills, interests and your desire to discover the city. All the tour options will be explained to you at the begining, in front of a big map on the wall of our shop. One of the most demanded options is the combination between "Madrid de los Austrias" and the Debod Temple. This tour is the real experience, the perfect way to discover the heritage of the city. An unforgettable trip through the most transcendental of Madrid: the Royal Palace and the Egyptian Temple of Debod. Enjoy the best views of the city from the different viewpoints on Factor Street and Debod Park before entering deeply into the oldest neighborhood of the city. Another very pleasant alternative is the combination between Barrio de las Letras and the Retiro park. The best option for those who want to enjoy driving the Segway. This option is a wonderful tour of the writers neighborhood. We will enter the emblematic Huertas street, with its golden letters that show us fragments of the works of our most valuable writers. Then we will visit the house of Miguel de Cervantes and later the Golden Mile without doubt an essential point. The space that holds the most works of art in the world, as well as the world-famous Prado Museum. A perfect ride for art lovers. The Retiro Park, the Paseo del Prado and the longest street in Madrid, Calle Alcalá. A perfect mix between the two routes of greater distance. But do not worry if you are tired of going to the same places that all the other tourist visit, we will give you the chance to discover some of the corners that are reserved only for few visitors. In short a very good way to discover the city, its history and heritage in a fun and healthy way.